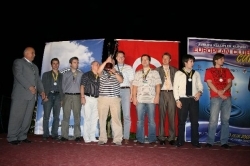 Linex Magic and Cercle d’Eches Monte Carlo are Winners of the European Club Cup 2007 European Club 2007 is over. Yesterday, the final round games were played and after the closing ceremony the organization was completed. 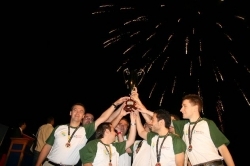 In men’s section Linex Merida won the event with 13 points followed by Ural Sverdlovskaya with 12 points. The third place was shared by Tomsk-400 and Baden Baden but the winner of the last two years Tomsk-400 got the bronze medal. In women's section AVS Krasnotourinsk won 3-1 against Monte-Carlo but it was only enough for eqalizing the points with their opponents but not getting the gold medal. Both teams were followed by MIKA Yerevan, Southern Ural Cheliabinsk and Finec St.Petersburg but the Armenian side got the bronze. You can find more details about the closing ceremony and the last round at the link below. 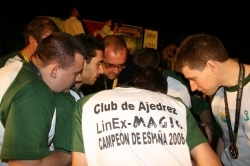 Linex Magic Merida team did not miss the opportunity to grab the trophy and after beating Tomsk, they beat another Russian team, Economist Saratov with 4-2 to win the European Club Cup 2007 for Men. 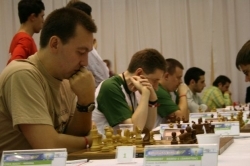 Gata Kamsky, highly performed in the final rounds despite it was the other way so in the beginning and won against Russian champion Evgeny Alekseev. Rublevsky won against Tiviakov in an ending that arose from Rossolimo Sicilian. 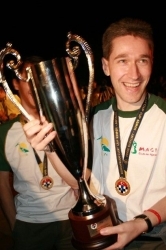 Ivan Cheparinov won against winner of Valjevo 2007, Michael Roiz. 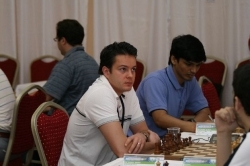 Korneev’s win against IM Candelario was not enough for the Russian team to catch. Ural Sverdlovskaya had to beat Bosna Sarajevo to enter among the medal winning teams. 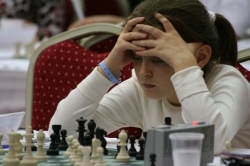 Ivanchuk, lost against Radjabov while pushing the game too hard while Alexi Shirov won against Zoltan Almasi which led to a 4-2 win for the Russian side since the other games ended as a draw. On the third board, Baden Baden scrored a 4-2 win against French side with Anand winning against Pelletier while Carlsen won against Fressinet and Harikrishna against David. ACP President Tregubov's victory against Etienne Bacrot was not sufficient for the French side to extract points out of this encounter. In women's section the match of the first two seeds was not likely to determine the winner since Monte-Carlo only has to get 1 points. The match ended as a 3-1 for the Russian side! 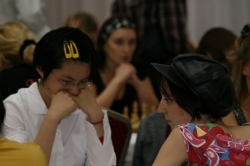 Humpy Koneru who was the top performer in women's event with 2800 performance with a 5.5/6 score made a quick draw with World Champion GM Xu Yuhua but ex-world champion Antoaneta Stefanova and Natalija Pogonina scored wins against Pia Cramling and Monika Socko respectively. On the second board, Interplast Tbilis lost 1-3 against MIKA Yerevan and the latter side won the bronze medal after the tie-break with Southern Ural Cheliabinsk and Finec St.Petersburg who won 3.5-0.5 against Economist Saratov and SK T-Com Pdgorica respectively. Turkish Airlines gained an importannt draw against Ladya Kazan when WIM Zehra Topel and Gozde Dinçok won their games against IM Inna Gaponenko and WGM Sangudach Shaidullinna. Michael Adams, celebrating his teams' success. 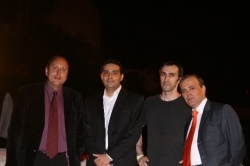 President of the French Chess Federation Jena Claude-Moignt, Bülent Kaptan and U?ur Dündar, President of TCF Ali Nihat Yaz?c? Kateryna Lahno and Ayça Fatma Durmaz one of the smallest competitors in the event.